NEW ORLEANS — An exhibit opening Thursday at the National World War II Museum in New Orleans features dogs, horses and other animals used during the war. "Loyal Forces: The Animals of WWII" showcases the species most often brought into the war. The first exhibit highlights the Coast Guard shore patrol, which used 3,000 horses. German horses represent the European theater. North Africa and the Mediterranean are represented by pigeons. An oral history from Hiram Boone, a mule handler for the Army's Mars Task Force, informs the China, Burma and India theater exhibit. And for the Pacific front, there are the dogs, including Smoky the Yorkshire terrier, who pulled a telegraph wire through a pipe that was 70 feet long and 8 inches wide. NEW ORLEANS (AP) — Smoky the Yorkshire terrier, Lady Astor the pigeon and a host of horses and mules whose individual stories are lost to history are among war heroes and heroines featured in the latest exhibit at the National World War II Museum. "Loyal Force: Animals at War" will run July 22-Oct. 17, featuring the four kinds of animals most often brought into the war, as they were used in all five theaters. "There was a great love and loyalty between the soldiers and the animals they worked with," said registrar Toni M. Kiser, who created the exhibit with archivist Lindsey Barnes. The exhibit opener may seem odd to people used to thinking of the Coast Guard as offshore duty in cutters, patrol boats, helicopters and airplanes. In the mezzanine, where a Sherman tank and a half-track represent the period's most common cavalry, will be a figure of a Coast Guardsman on shore patrol with his horse. The shore patrols were set up after German saboteurs twice landed on American beaches. "Luckily, before they could wreak havoc they were caught," said Kiser. "But there was this great fear that we really had to protect America's coastline." Nearly 3,000 horses, provided by the Army Quartermaster Corps, let the shore patrol cover much more ground. "The U.S. Coast Guard used more horses than any other branch of the U.S. Military during WWII," the title panel notes. The first thing visitors will see in the special exhibits gallery is a German reconnaissance horse and soldier, representing the European theater. Germany's 1st Cavalry Division pursued the Soviet Army through the northern marshes of the Soviet Union, but was disbanded and mechanized in November 1941, largely because horses needed extensive supplies and attention, and Adolf Hitler considered them outmoded. But most supplies and a great deal of artillery were still horse-drawn, and a mounted infantry squadron patrolled about six miles in front of every German infantry division. "These mounted patrol troops were referred to as the 'eyes and ears of their units,'" an exhibit panel explains. The museum's artifacts were part of the reason for including the German horse, Barnes said. "We have a really great saddle" and a dagger from the infamous 8th SS Kavallerie Division Florian Geyer. North Africa and the Mediterranean are represented by pigeons such as Lady Astor, which brought an urgent message to Allied forces from the front lines in North Africa in spite of pellet fire that broke one leg and took half the feathers from one wing. An oral history from Hiram Boone, a muleskinner for the Army's Mars Task Force, informs the China, Burma and India theater exhibit. For the Pacific front, there are the dogs. Smoky, found in a foxhole in New Guinea, was a mascot who became a war heroine when engineers needed to run 70 feet of telegraph wire through an 8-inch culvert under an airfield. Cpl. William Wynne, who had adopted Smoky and taught her many tricks, tied one end of the wire to Smoky's collar and had his buddies hold Smoky at one end of the culvert while he called her from the other. Her story is among a half-dozen featured on a touch-screen display, as is that of Kurt, a Doberman Pinscher who alerted his handler to Japanese soldiers lying in wait above the Asan Point beachhead on Guam, but was killed by a mortar shell. Bronze statues of Smoky in a "pot" helmet and Kurt, lying down but on the alert, also are part of the exhibit. Kurt's statue is a replica of one at the United States Marine Corps War Dog Cemetery in Guam. Sculptor Susan Bahary also put Barnes in touch with the widow of Lt. William Putney, commanding officer of the 3rd U.S. War Dog Platoon, who led 110 Marines and 72 dogs from Camp Lejeune and Camp Pendleton to Guadalcanal and Guam. His veterinarian's kit, donated to the museum by Betsy Putney, is set up in the sort field hospital used for dogs. "A lot of stuff they had was the same as for humans," Barnes said. 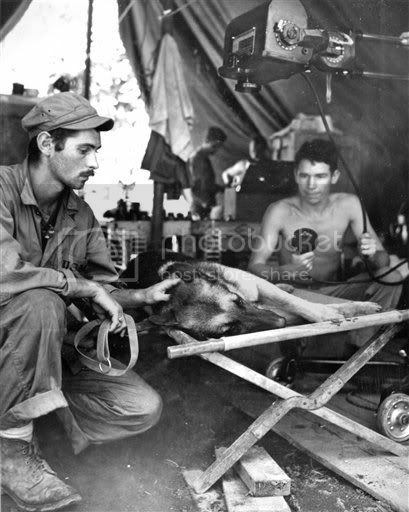 "It took a while for the Army to get around to having special supplies for dogs." There's also a mascot slideshow and a narrated "slideshow movie" about servicemen's encounters with exotic animals — playing with monkeys, riding on elephants and camels. One photo, from the Pacific, shows eight men holding the skin of a python. "The expressions on their faces are pretty telling — how foreign and exciting this was," Barnes said. They had to omit lots of stories, such as that of the bear that carried artillery ammunition during the battle of Monte Cassino (it had been enlisted into the Polish Army because the soldiers weren't allowed to have mascots). "We really wanted to concentrate on the animals that were used by the thousands to help the military," Kiser said. Hopefully this is a travelling exhibit. I wouldn't mind going to see it if it came to a closer location.